Corruption : A Major Setback. Posted bypooja prithiani May 29, 2014 January 18, 2015 Leave a comment on Corruption : A Major Setback. from school days till now we are reading books that India is a developing country our parents has also read the same in their school days in textbooks.you know one of the major loophole which is stopping India from becoming a developing country is the corruption.Corruption in India is one of the major setbacks for developing India. The corruption flourishes from top to bottom level and as a result of this the poor innocent people are becoming victim of this corruption. Except very few people who are living with principle, remaining all are indulging in corruption in one or other way around by misusing their powers or positions. In top level, the corruption is in the form of scams and in the bottom level the corruption is in the form of bribes. Though the corruption at the bottom level is low but it accumulates as bigger as a scam because at the bottom level crores of people indulging in corruption. We, the people of India much familiar with the corruption or scam of few politicians. They just misusing their position or power to execute corruption in India. The greediness and selfishness are the two key aspects of corruption. In each and every lok sabha or assembly election, the contesting candidate require crores of rupees for their canvassing in election, so they want to heap lot of money either by hook or crook. As a result of implementation of panchayat raj in India, all panchayat receives crores of rupees from the Government for the development of their constituency. But a major part of money washed up for extortion. During the election, Indian media flashed their news an image of distributing thousand rupee notes and other household items to drag the voters towards his party. As for as recruitment process is concerned, the few politicians recommending his candidate to the concerned officer for a Government job by demand a huge amount as a bribe from the candidate in concern with the post and the scale of pay of the post applied for by the candidate. The bribery amount varies with the scale of pay of the post applied for. Government officers are the authorized person to handle the Government property but it is painful to know that the fence eats up all the crops. There are few officers of selfishness and greediness to become rich overnight they forbearing in corruption through all possible means to heap lot of money in their name inside or outside of India. 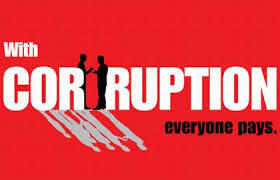 Private contracting is one of the most inducing factor of Corruption in India. It includes contracting for the construction of building, roads, bridges,hiring vehicles, hiring ships, arms and ammunition, electronic gadgets, stationery in offices and selecting their own candidate for a post by taking considerable amount as a bribe. We are progressing swiftly to occupy the name of our country in the top of most corrupting countries in the world. ‘Sun is the sources of all energy’ in the same way ‘Common people of India are the causes of all Corruption’. It was noticed many times that during election, the common people demanding bribe for casting vote in favor of a particular party or the candidate. Many of them voted even for a bottle of liquor whom we consider the responsible citizen of India. So, these activities energize the corruption in India. Do not indulge in corruption, first save yourself from the evil and then reveal the same to anti corruption unit for further investigation. Have your hands clean so that we can point out others. It is my appeal, on behalf of people of India to the Government to clean corruption in India from the top level, by hitting at the top level the bottom will automatically get their right position. Hoping for a corruption free India.